HOT MANIKI NEKO NEWS FLASH! According to yesterday’s evening edition of the the Chunichi Newspaper, the type of maneki neko that sells the most has changed drastically since 2008. 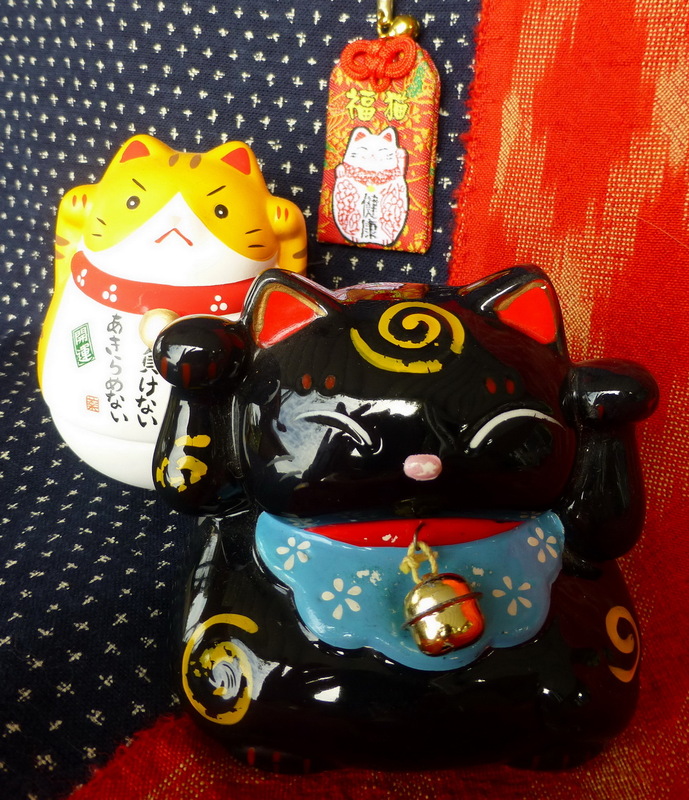 From around 2000 to 2007, 90% of the lucky cats sold in Tokoname, one of the main pottery towns in Aichi prefecture, had their left paw up (to beckon/attract customers) and 10% had their right paw up (to beckon money). However, in 2008, when the derivatives disaster almost wiped out the world economy (known as the Lehman Shock in Japan), everything changed. Suddenly, lucky cats with both paws up became popular, and to make sure that nobody would interpret both paws up as a gesture meaning “I give up!”, the lucky cat makers created a cat that has one paw raised slightly higher than the other paw. Today, 70% of lucky cats sold have both paws raised (to beckon both customers and money), 20% have the right paw raised (money) and 10% have the left paw raised (customers). The economic crisis is continuing in Japan. People and companies have adjusted their wishes, and the maneki neko, always a bellwether of the economy, has adapted to the times.